Practice German against the stunning backdrop of the Rhine valley, with its historic castles and medieval towns. The Rhineland offers a beautiful setting allowing students to discover a new culture whilst improve their German skills. Our experts can help plan, book and organise a memorable language trip! The Lorelei is an impressive rock soaring 120m above the waterline on the eastern bank of the Rhine. Steeped in folklore, it is the most famous feature of the Rhine Gorge. You can admire it from the river on a cruise that takes you past medieval castles and picturesque villages. Most tours are accompanied with running commentary in English. Marksburg is said to be the best-preserved castle in the Rhine Valley with a keep built around 1200, a battery with guns strategically pointing towards the Rhine, and a Gothic hall. Those fascinated by the grim and gruesome may want to visit the torture chamber with its collection of instruments of punishment from thumbscrews to hooks, racks and chains. This is a historic city is at the confluence of the Rhine and Moselle. It offers ancient bridges, an interesting old town, a large shopping centre, the 13th-century Liebfraukirche and the wine producers’ market place. See the magnificent statue of William I, Germany’s first emperor at the Deutches Eck or visit Romanticum – the city’s newest attraction. Take the cable car to the Ehrenbreitstein fortress towering above the city. The interactive exhibition is housed in a stunning modern building, the Forum Confluentes culture centre. It brings to life fascinating aspects of the Middle Rhine Valley over an area of 800 m². Take a journey through time as a steamship passenger and experience the romance of the Rhine up close while getting to know the river and its legends and myths. Your group can enjoy the riverside promenade, its lively squares and quiet lanes, as well as its lush hills, valleys and vineyards. For the best view of the largest bend on the Rhine, take a trip on the chairlift from Mühltal to Gedeonseck. A one hour guided tour in German is available with a bi-lingual guide who can adjust the language level to the level of your students. Spend the day in Cologne discovering the galleries, museums and architecture of the Rhineland’s capital city including the world heritage site of Cologne Cathedral. At the popular chocolate museum learn about the history and production of chocolate. Cologne has wonderful Christmas Markets during the advent period. Travelbound can arrange language lessons at a local language school. This gives students a chance to work on grammar, vocabulary and pronunciation. Afterwards, they can use what they have learned in a real context. Focused study combined with immersion in the language leads to the speedy development of more advanced skills. This medieval castle (12th-16th century) towers on a large rock that sits in a picturesque valley. It is unscathed by wars and has been owned and cared for by the same family since it was built. Many of the original furnishings of the past eight centuries still remain in place. There is a treasury and armoury boasting world-class artworks in gold and silver. This engaging museum is among the top ten most popular in Germany. It shows the entire history of chocolate, from its beginnings with the Olmecs, Maya and Aztecs to contemporary products and production methods. There’s a tropicarium with cacao trees, and students can indulge in the chocolate fountain. There are six themed zones to explore at this park: Fantasy, Deep in Africa, Berlin, Mystery, Mexico and China Town. For adrenaline thrills try the Black Mamba ride or Colorado Adventure – a mine train roller coaster. Visit the Mystery Castle or marvel at the Chinese acrobats. The entrance includes a snack pack for students. Image by Stefan Scheer GFDL, via Wikimedia Commons. Trier, on the river Moselle, is Germany’s oldest city – founded by Emperor Constantine the Great in the 4th century AD as the capital of the Western Roman Empire. Discover the UNESCO World Heritage Roman monuments, the Imperial baths, the amphitheatre and the Porta Nigra on a guided tour. The city has impressive medieval buildings including the Cathedral of St. Peter and the Church of Our Lady. The pretty wine town of Rüdesheim is home to a whole host of museums, cobbled streets, half-timbered houses and the oldest castle in the Rhine Gorge. 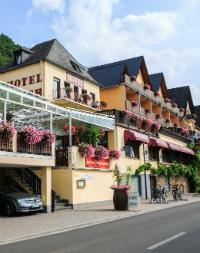 Wander along the pretty Drosselgasse with its taverns and shops. Take the chairlift to the Niederwald Monument which commemorates the re-establishment of the German empire. Visit Siegfried’s Mechanical Music Cabinet, the Wine Museum or the gruesome Torture Museum. Practice German in Berlin, Germany’s capital with its dramatic history, thriving cultural scene and great museums and galleries. Students will enjoy practicing their German skills with locals. We can help plan other modern foreign language trips, from French, Spanish, and Mandarin. We guarantee you will enjoy our tours as much as your students! Be the teacher to immerse your students in the language and culture of China’s capital city with a MFL trip to Beijing. China is perfect to help your students learn Mandarin. Other popular modern foreign language choices include French, German, and Spanish, or we can help with other languages as needed. We’ll help plan, book, advise and organise so you can enjoy the tour as much as your class will.